THE NATURAL HAVEN: Does male hair grow faster than female hair? Does male hair grow faster than female hair? This question was posed to me by the lovely Laquita who wanted to know why is it men do nothing to their hair (shampoo with whatever, don't know what a conditioner is, never use a moisturiser.........) and yet seem to grow perfectly healthy long hair. Yes male hair does grow faster than female hair atleast according to the only study I could find on the subject (J Invest Dermatol, 56:5, pp 362-365, 1971). However the difference was not much, only about 6.5% longer on average (or about 0.75mm per month). Does less than 1mm matter? The next quest: Do men really do have a longer growing phase (known as anagen) than women. Sadly there is no answer to this section. While there is no shortage of studies on women, it seems the societal norm is for men to cut their hair. I was so desperate that I even looked specifically for studies on Sikh men because I know quite a few never cut their hair, sadly I found only studies on balding and loss of hair through traction. So it appears that the thicker your hair is, the faster and the longer it will grow. I guess the fine haired girls like myself can be content with the fact that we will tend to have virtually hairless legs........ lol. I do think that the fact that men leave their hair alone (i.e manipulate it much less) is also a major factor. It does appear though that they have a genetic advantage. lol lovin the blessin. Yeah stronger thicker longer hair and a moustache, beard and some chest hair. It may seem like a joke but there is actually a female condition known as Hirsutism . It happens when when male hormones are not balanced as they should (because women do have testosterone just not in the level of men). 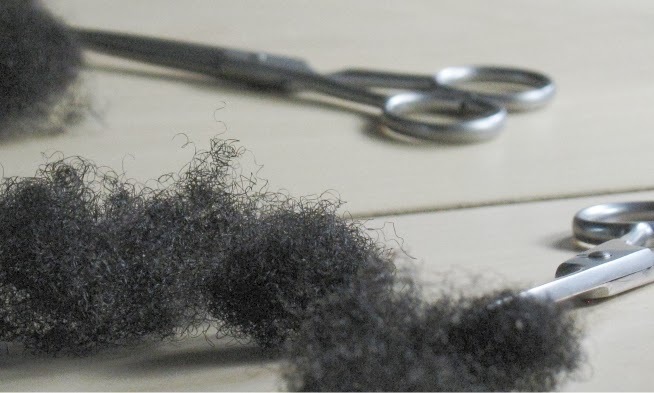 In short in order to have plenty of hair on your head as a result of testosterone, you will have to trade that with body hair everywhere (head to toe -literally). Interesting. I did wonder about this! Thanks for the information about men's hair growing faster than women's...but only by a minute amount. It has always been obvious to me that men retain length better than women because they're not always MESSING with their hair. Consequently, for a while my advice to women who wanted to grow their hair was to do whatever their male relatives were doing. great post! I have always wondered this. I have seen many natural men with thick wild hair that is long!!! Men might not mess with there hair but I have viewed some men whose hair is loose, so doesn't that contribute to knots and split ends? Awesome as this confirms some of my thoughts! My bf can get his hair cut by several inches and it will grow back in no time. I've noticed his hair length increase from one week to another! Mine.. always looks the same. Never gets longer, only shorter (if I trim or cut). The study didn't say "coarse" hair it said thick and long hair that grows faster. Usually thin hair appears to be coarse. Thick hair is glossy and smooth. I have since learned that many people use the word coarse to mean thick strands. This is as opposed to coarse to mean textured. no thick in strands size but thick hair can be rough textured hair or finer hair. Actually ppl with dark colored hair have thicker strands than lighter colored hair. but ppl with lighter hsir have more strands per sqare inch. I think about hairy women as well... They always tend to have very long hair like caucasians, latin, and middle eastern women. It probaly has nothing to do with testorone because racial characteristics don't always pertain to hormone levels, but more the environment. Do you have references for what you are saying or is this supposition?